Dr. Charles Flowers is dedicated to offering area residents the finest possible care that he and 21st century dentistry can provide. He begins your dental care by patiently listening to your dental concerns and goals so that he can better personalize your treatments. After a thorough exam, he’ll discuss his diagnosis in easy-to-understand language. Not only will he explain to you the treatment he recommends the most, but he’ll also give you alternate treatment options. 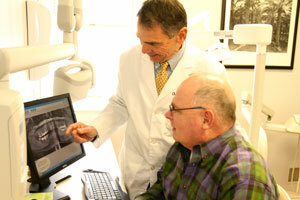 Moreover, he keeps prices reasonable so that patients can afford a healthy smile that looks fantastic. Together with the help of his caring, efficient and thoughtful staff, Dr. Flowers would like to show you what truly comfortable and gentle dentistry is really all about. Dr. Flowers keeps up with the latest dental technologies. Dr. Flowers believes that a dentist’s education never truly ends. 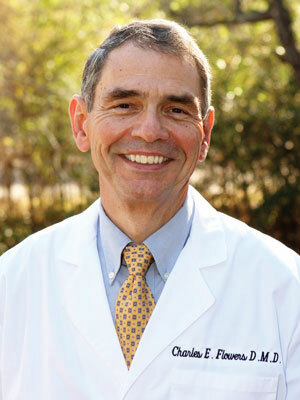 In 1976 he received his Doctor of Dental Medicine degree from the Medical University of South Carolina. Dr. Flowers has also completed hundreds of continuing education courses to enhance his overall knowledge of general dentistry and to keep abreast of the latest developments in his field. Over the decades Dr. Flowers has developed a special interest in oral surgery, endodontics (root canal treatment) and dental implant dentistry. He has attended numerous courses on these select topics and over the last 30 years he has performed thousands of preventative, restorative and cosmetic dentistry procedures. Dr. Flowers is an active member in good standing of the American Dental Association and the South Carolina Dental Association, as well as other professional groups and clubs. Dr. Flowers really cares about his patients. Dr. Charles Flowers has been providing comprehensive general, implant and cosmetic dental services to Charleston area residents for well over three decades. He delivers his special brand of dentistry with a kind smile, a gentle touch and a compassionate heart. He’s reminiscent of the old-fashioned country doctor who remembered your name, listened to what you had to say and really cared about you and your family. Dr. Flowers comes from a long line of North Carolina doctors. His father was a physician, his grandfather was a real country doctor, and his great-grandfather was a black bag carrying country doctor, as well. Following in their footsteps, Dr. 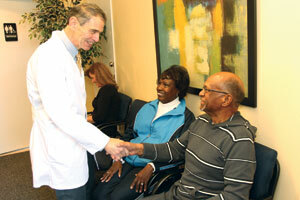 Flowers created his practice with his family’s tradition of personalized patient care in mind. When he isn’t busy transforming smiles, Dr. Flowers enjoys flying airplanes, hunting, fishing and sporting clays. However, his most enjoyable free time is spent with his two granddaughters who keep him quite busy. Dr. Flowers, a graduate from The Citadel and member of the Army ROTC, has great respect and admiration for the men and women serving in our Armed Forces. For over three decades he has been making smile-enhancing dentistry more convenient for our patriots stationed at Fort Jackson. Dr. Flowers accepts United Concordia insurance for active soldiers, Logistics Health Incorporated for reserve and National Guard troops, and Delta Dental for retired military personnel. He also does whatever it takes to see our soldiers and make sure they get the dental care they need on a timely basis. He knows that our soldiers cannot just leave the base whenever they like. And that is why he works closely with them to make sure they get an appointment that fits their busy schedule.